The majority of our energy challenges are, at their core, due to intrinsic limitations of available materials with the required properties. By creating new materials with superlative properties including exceptional strength-to-weight ratios, resistance to corrosion, enhanced energy storage capacities, improved catalytic function and superior conversion and transport mechanisms, revolutionary energy savings can be achieved. Materials play a key role in all aspects of energy storage, conversion and utilization, and new materials are needed to improve performance in broad aspects of energy systems from solar, batteries, and fuels to new structural materials. In particular, entirely new strategies are required to access paradigm-shifting, transformative materials. While traditionally most materials are created at or near ambient pressure, exploiting extreme environments, notably high pressures and temperatures, has tremendous potential for manipulating matter to synthesize next-generation materials with transformative impacts on energy. Moreover, materials in these extreme environments often exhibit optimal properties for energy applications. For example, extreme environments are capable of producing materials with unprecedented mechanical, thermal, and electronic properties. EFree addresses specific knowledge gaps in the discovery of these paradigm-shifting, transformative energy materials. (Fig. 1). Novel materials to be discovered are broadly applicable to all classes of frontier energy research. The Center targets three focus areas, dictated by classes of energy materials and applications: advanced structural materials, novel energy conversion materials, and revolutionary energy transport materials. Our mission is to study materials under extreme conditions to deepen our understanding of materials behavior, enabling new materials to be discovered and, ultimately produced by design for practical use at ambient conditions. 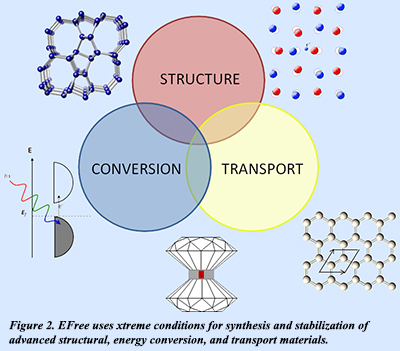 To achieve this goal, EFree personnel are working to synthesize fundamentally new materials and to exploit them for energy science through a focus on understanding kinetically stabilized routes to ambient pressure. We are focusing on studying, manipulating and ultimately controlling materials in regimes outside their fields of thermodynamic stability. In this, we employ new methodological approaches that allow access to new regions of phase space by treating recoverable high-pressure compounds as precursors for subsequent ambient-pressure manipulation. We also are exploiting pressure to mediate kinetically controlled synthesis of new materials in the solid state. Here, alternative reaction pathways are ‘engineered’ by using pressure to control the structure of precursors. In many systems, these pathways need not lead to thermodynamically stable reaction products, but to other new materials that can be stabilized by exploiting the kinetic limits of reaction rates. Finally, we are also using chemical pressure and epitaxial growth to enhance the ambient-pressure stability of materials that exhibit exceptional high-pressure energy transport properties. By design, these approaches are highly synergistic and are exploited to forge effective collaboration across the Center using both experiment and theory (Fig. 2). Please see the Department of Energy website (http://www.sc.doe.gov/bes/EFRC.html) for more information about the centers. For more information about Carnegie’s Geophysical Laboratory see http://www.gl.ciw.edu/.